Martha Latta isn't your typical Sunday Afternoon Housewife. This gal is super crafty and uses her time at home to create a selection of accessories that are stylish, yet affordable. Currently she offers a variety of glass tile pendants, such as the beautiful red bird. Also available are pendants made using Scrabble tiles and poker chips! All pieces are embellished with wonderful graphics that will suit just about everyone. Martha can be found throughout the year at craft shows around the country, including our fall event The Funky Finds Experience! *GIVEAWAY - Closed - Congrats taniamc! Martha is giving away a prize pack consisting of a Scrabble Tile Pendant, Poker Chip Pendant, and Sunday Afternoon Housewife Magnet. To enter, visit Sunday Afternoon Housewife and leave a comment on this post noting your favorite item. Giveaway ends at 9pm EST, Sunday, August 15. Cool! I love Home Sweet Hoot! lol...I think the design is fun and it just makes me smile to see it. Love the Girls Just Want to Have Fun group! OK... I really like all of them but The Vintage Birdcage, Crafty and Owl Love all stick out. Can't wait to see her (and you) at the Funky Finds Experience! I love them all but if I have to narrow it down, the Vintage Nasturtiums would be my favorite! Thanks! I love the vintage flowers on the glass tile. i love either home sweet hoot or the owl love scrabble tile pendant! i love love love owls! I love all Martha's designs! My personal favorites are the owl designs, but there is no denying the cuteness of all of them! I love the owl scrabble tile! They are all so cute! I love the Vintage Poppy. The Bird Cage and poppy and Vintage Birds and Poppy! Love them all! I like the Owl Love Scrabble Tile Pendant. I LOVE the Vintage Poppy. I love all of your things! Breathtaking! They are all fabulous! (and so affordable) but I think that Red Bird glass pendant has my heart. 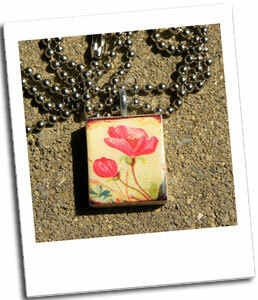 I love the poppy necklace!